The Luxe is the ultimate luxury fifth wheel manufactured by The RV Factory. THE RV FACTORY LLC, is the Manufacturer of the Luxe brand luxury 5th wheels. At the heart of the company is a factory direct business model, bringing together both manufacturer and the more discriminating retail consumer. 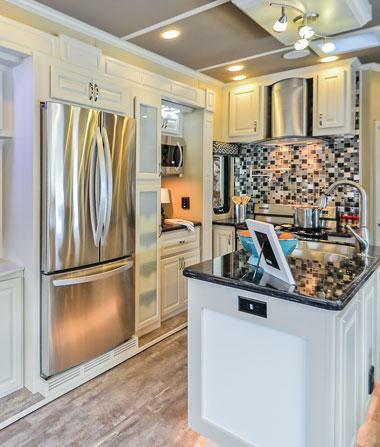 This model is driven by over 35 years of RV manufacturing experience. Driving this customer experience is founder and chairman Brian Shea. Brian believes it's time to focus on the retail customer's needs. "I have been fortunate enough to have been part of one of the most successful manufacturing companies in Elkhart, Indiana," stated Shea, "since 1971 working with my father at Fairmont Homes and later at Gulf Stream Coach, I learned the importance of great looking product built with residential construction principles. " Brian Shea's father, Jim Shea Sr. was the founder of both Fairmont Homes and Gulf Stream Coach, Brian would later become the President of Gulf Stream Coach in the 90's for over 15 years. "During those many decades I learned the importance of product details and value. " THE RV FACTORY, LLC is selling products directly to the retail customer, "there is a new mandate from the retail customer", Shea explains, "they want to have a close relationship with the people they buy from. This is evident when you consider the impact companies like Apple, Starbucks, Gap Jeans have made on the retail marketplace. These companies get to tell their own story in their own words to the retail customer. This is the most exciting part about THE RV FACTORY." We have a 50,000 sq ft production facility located in Elkhart, Indiana producing Luxe luxury 5th wheels. In addition to the production facility, THE RV FACTORY has a 10,000 sq ft indoor showroom. "Our products are immediately recognizable by those familiar with the RV industry. It is our intent to offer great brands with the best and newest designs and construction in the fifth wheel camper manufacturing catagory. When dealing directly with the manufacturer, the customer can choose what options they would like and a broad color pallet of interior and exterior color choices not available from other manufacturers of luxury fifth wheels. THE RV FACTORY has assemble an experienced management team to deliver the factory direct model for the retail customer with their personal preferences in mind. With a degree of options, we can meet their individual needs and achieve a very satisfying experience. It is clear with recent success by companies like Apple and Tesla Car company that the retail customer is feeling comfortable with buying products directly from the manufacturer bypassing the middleman.